FamilySearch has a boatload of church records scanned and available online for Germany, Prussia, and Pomerania from 1544-1945, though I would estimate that most of them are in the middle of that range. Currently they’re not available for searching, but I did see them in the indexing software, so maybe they will be available for that soon. That means you must look through them by hand, like the good ol’ days. It seems that a lot of families from this area of Wisconsin immigrated from that area, which is now mostly in Poland, so I’m in luck. I used this collection to find a few records so far. I found my 3rd-great-grandparent’s marriage record and my 3rd-great-grandfather’s baptism record (I’m pretty sure.) Keep in mind that the towns and parishes are not named the same as they were in the 1800s, so you can’t just go to Google Maps. Don’t worry, I’ve done some of the hard work for you and will show you how to find the records you need. Though, this won’t do all of the browsing record by record and trying to determine what someone wrote in German on old, ripped paper from 1840 for you, but maybe for a few bucks I can do that for you, too. Some of the Pommern church records available. Welcome to the most comprehensive database of its kind in the world. It contains 93537 locations with over 38.691 name changes once, and 5,500 twice and more. Included in this database are the following provinces: Eastprussia, including Memel, Westprussia, Brandenburg, Posen, Pomerania, and Silesia. It currently list most towns or points, points being: Mills, some bridges, battlefields, named trees, cenotaphs etc. Let’s say, using my research, that you find an immigration record that indicates your family were originally from “Naugard.” You go to Google Maps but find out that there is no Naugard in that area of Europe. (Funny story, I just tried it and Google does bring up the current city, but don’t expect that to work on every one.) 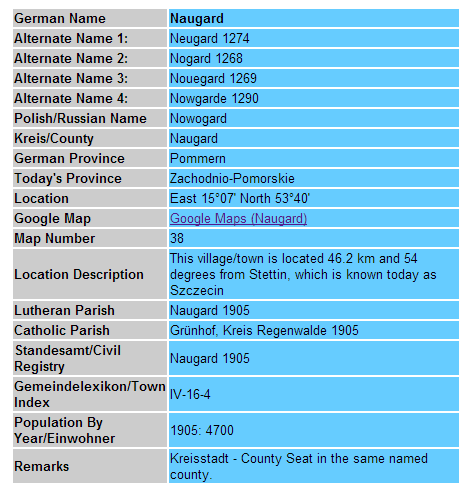 You would go to Kartenmeister and type “Naugard” into the “German City Name” field and hit “Submit.” It would bring up a listing of matching items, 5 in this case. Usually the first item is the one you need, but not always so look around. Once inside of one of the items it gives you all kinds of info on it, including the current Polish name (Nowogard in this case.) There is also a handy-dandy link to Google Maps set to the coordinates of the item. A really helpful field for what we’re doing is either the “Lutheran Parish” or the “Catholic Parish,” depending on which one you need. This will tell you what parish you need to look for in the FamilySearch records. Bigger towns usually have their own parish, but some of the smaller towns go to another area. One other helpful part of this info screen is the “View Emails of Interested People” button. This will take you to a page of people researching families in this town showing surnames and their contact info. You can also add your name to the list, though be careful, it’s a bit clunky so make sure everything is correct before submitting. 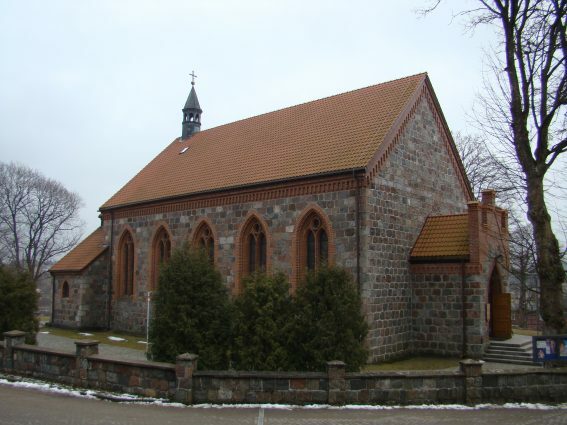 So, for our example, the “Lutheran Parish” is labeled as “Naugard, 1905” which is the town itself. I assume the year is when the info was found. I didn’t find any records in that parish for my family, so the next step was for me to go to this location in Google Maps and check out other nearby towns to see what other parishes are nearby. I tried a few and then decided to test my luck on a city to the north called Płoty today. How do I find the original German name? Kartenmeister! There were three separate entries for Plathe: “Evangelische Kirche Plathe”, “Evangelische Kirche Plathe: Heydebreck”, and “Evangelische Kirche Plathe: Neuenhagen, Lietzow, Mackfitz, Mittelhagen, Altenhagen.” Those are just separate towns, I think, for that parish. Maybe they kept them in different areas, I don’t know. Out of sheer luck I found their record in the main Plathe collection, which opened up more research avenues including finding Johann’s baptism. I have yet to find his wife Charlotte’s baptism record, but I keep looking. Not all parishes and towns are that easy. Take my great-great-grandmother’s baptism record, for instance. Records indicate she was born in “Storkow, Pommerania.” A quick search of “Storkow” on Kartenmeister shows multiple Storkows with only a few having records available. I am currently browsing through one of the collections page by page and noting all surnames that may be involved. 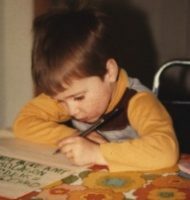 It’s a bit tedious, but when you find that original record, it’s all worth it.